ZIMBABWE – Zanu PF politics is proving true the old adage that says those who live by the sword die by the sword, as a fresh wave of purges in the ruling party are targeting those who were instrumental in the dramatic outster of former Vice-President Joice Mujuru. Ruling party provincial chairpersons that replaced alleged Mujuru loyalists in the purge that started last December, are now facing the music. Former Harare acting provincial chairperson, Godwills Masimirembwa was the first to fall in June, barely a few months after playing a key role in the expulsion of the late Amos Midzi. When he rose to welcome guests to the Zanu PF elective congress in December last year, Masimirembwa sounded like a man on a mission, ready to exorcise Mujuru’s ghost in the troubled ruling party. His remarks were that of a man itching to cleanse the party’s structures of all “gamatox” elements that had “hijacked the revolutionary party for their own personal gains”. Today, he finds himself in the same predicament as the allegations levelled against Mujuru and her allies are the same he and other under-fire provincial chairpersons now face. When he was kicked out, the losing Mabvuku-Tafara parliamentary constituency candidate was accused of factionalism — the same thing that happened to Midzi. Masimirembwa is now just an ordinary card-carrying member, just like those accused of sympathising with Mujuru. But he is not alone in this predicament. Former Home Affairs deputy minister Ziyambi Ziyambi — who orchestrated the ouster of Temba Mliswa as Mashonaland West provincial chair for allegedly supporting Mujuru — has now also been tossed out . Ziyambi is serving a two-year suspension on allegations of factionalism and abuse of office. He lost the ministerial post and was reduced to an ordinary legislator divorced from the luxurious life he was exposed to in the last three years. Under his reign as Mashonaland West acting provincial chairperson, Ziyambi superintended over the suspension of former ministers Webster Shamu and Sylvester Nguni, among other senior party members. Another victim of Zanu PF’s renewed purges is Paradzai Chakona — a man who spearheaded the political demise of former Energy minister, Dzikamai Mavhaire and ex-Provincial Affairs minister Kudakwashe Bhasikiti from Masvingo province. Chakona was last week kicked out of his post following numerous allegations that include abuse of party resources and factionalism. He is linked to a camp that is supporting Vice-President Emmerson Mnangagwa to take over from President Robert Mugabe when he leaves office. Zanu PF secretary for administration in Masvingo, Ezra Chadzamira announced the decision during a provincial coordinating committee meeting held over a week ago. Among the allegations levelled against Chakona are abuse of party resources, imposition of candidates during the district elections and working with Mujuru. “We found that there were many allegations against Cde Chakona and we found that he was no longer worthy to be acting chairman,” Chidzamira said. Chakona was replaced by Amasa Nenjana as acting chairperson. Several Zanu PF provincial youth chairpersons, who last year helped engineer the political rise of First Lady Grace Mugabe, are also facing the boot. The campaign is allegedly targeted at party youth leaders perceived to be sympathetic to a Zanu PF faction fronted by Mnangagwa. Mashonaland Central youth chair Godfrey Tsenengamu, secretary for administration Paul Rwodzi and secretary for security Batsirai Musani were suspended after a votes of no confidence were passed against them. 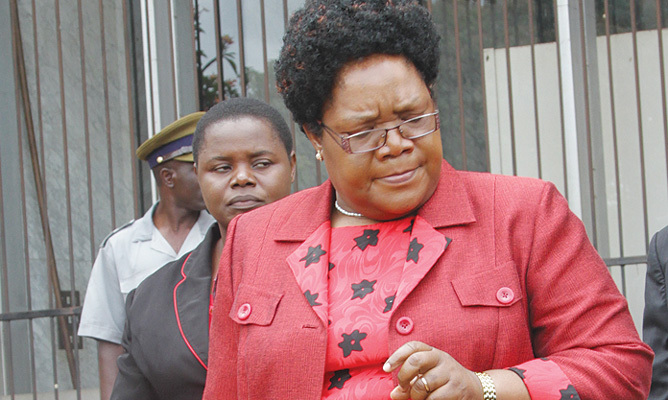 Votes of confidence were a popular tool used to oust suspected Mujuru loyalists. Political analyst, Alexandra Rusero said the bigwigs were testing their own medicine as they were at the receiving end of Zanu PF’s ruthless method of dealing with those who are seen as too ambitious. “Just like what happened to Mujuru, if you fail to master who has power in Zanu PF, you will fail, but it is how you treat the fall that matters most. Zanu PF is a party that can break ranks with its people for its leader, President Robert Mugabe,” said Rusero. When Ziyambi was fired, charges raised against him included disrespecting Grace, fanning factionalism in the province and supporting Mnangagwa. Also on the firing line is Mashonaland East provincial chair, Joel Biggie Matiza, who is being accused of supporting Mnangagwa to succeed Mugabe at the expense of Grace. “Currently, Zanu PF power lies with the First Lady and anyone who crosses that path certainly will be removed,” Rusero said. Another analyst, Ernest Mudzengi said the on-going purges in Zanu PF were a result of the unsolved succession issue. “As long as Mugabe and his Zanu PF keep the succession issue unresolved, fights will remain in the party and the purging will stay,” Mudzengi said. Grace recently resumed her provincial tours reminiscent of last year’s rallies that culminated in the ouster of Mujuru and several of her alleged sympathisers.